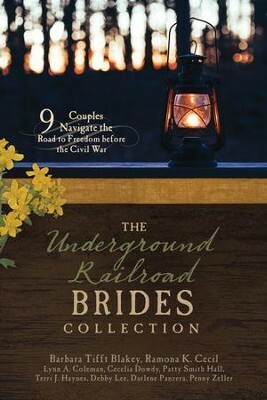 Nine couples pursue love and freedom along the historic Underground Railroad! Whether they're fleeing the cruelty of slavery themselves or helping others escape, the men and women in this 9-story collection are warriors for justice. You'll cheer as each pair passes through the dangerous slave-holding states and crosses the Mason-Dixon line to safety! 448 pages, softcover from Barbour. Charlotte Kimbrel, a Southern Belle, has been smuggling slaves. Captain Zachery Brownes ship sails slaves to freedom. Hostilities between the states are developing. Will Charlotte successfully travel the Underground Railroad by sea? Grieving over her beaus unjustified death, Rutha recently manumitted slave who is illiterateassists her upper-class boss as an abolitionist. Can she heal from the pain of slavery and learn to love again? Underground conductor Hudson Wallace is surprised when Jorgine Emerson asks him to transport her slaves to freedom, but is it a trap? Can Jorgines deep conviction win Hudson over? Winnie is hiding a secretHiram, a fugitive. Their lives cross at an Underground Railroad station. Can they overcome danger and find freedom in love? Budding abolitionist, Annie Morrison, discovers the man shes fallen in love with may be a slave catcher in disguise. Barbara Tifft Blakey lives in the Pacific Northwest on five wooded acres with Terry, her husband of forty-plus years. She is best known for her award-winning, literature-inspired, language arts program, Total Language Plus, which she created over twenty years ago, and is used by thousands of homeschoolers. Barbara teaches Sunday school and enjoys speaking on various topics to Christian womens groups. She and her husband have four grown children and five grandchildren. She enjoys camping at the ocean and is an avid soccer fan. During the day-light challenged winter months, she reads, crochets, bakes, and plots her next novel. PATTY SMITH HALL is an award-winning, multi-published author with Love Inspired Historical and Heartsong/Harlequin. She currently serves as president of the ACFW-Atlanta chapter and is active on Facebook, Pinterest and Twitter. She calls North Georgia her home which she shares with her husband of 30+ years, Danny; two gorgeous daughters and a future son-in-love. Visit her website at www.pattysmithhall.com. Terri is a 2010 American Christian Fiction Writers Genesis contest finalist, and a 2012 semi-finalist. She is also a 2013 Amazon Breakthrough Novel Award Quarterfinalist. Her publishing credits include: Cup of Comfort for Military Families, Crosswalk.com, the Secret Place Devotional, Urbanfaith.com, Vista Devotional, and Publishers Weekly. Terri holds a Bachelor's Degree in Theology, a Master's degree in Theological Studies and a certificate in creative writing and graphic design, meeting the minimal requirements of being a geek. She and her husband pastor a church where she serves as executive pastor and worship leader. Terri lives in Maryland with her three wonderful children and her husband, who often beg her not to kill off their favorite characters. While Penny Zeller has had a love for writing since childhood, she began her adult writing career penning articles for national and regional publications. Today, Penny is a multi-published, award-winning author of inspirational books. She is a homeschool mom of two and actively devotes her time to coaching homeschool P.E. and teaching at her local homeschool co-op. Her passion is to assist and nurture women and children into a closer relationship with Christ. When Penny is not writing, she enjoys spending time with her husband and children while camping, hiking, canoeing, reading, running, gardening, and playing volleyball. I'm the author/artist and I want to review The Underground Railroad Brides Collection: 9 Couples Navigate the Road to Freedom Before the Civil War.